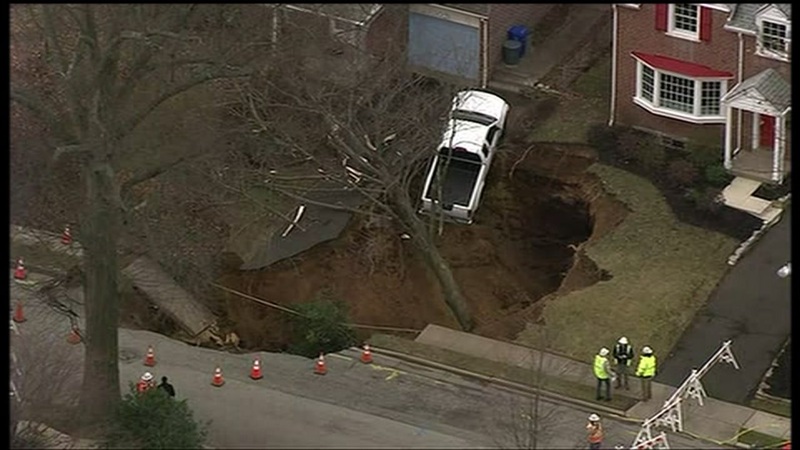 CHELTENHAM, PA -- A large sinkhole has opened up in a Montgomery County neighborhood, partially swallowing a pickup truck and prompting evacuations. It happened early Wednesday morning on the 700 block of Brooke Road in Cheltenham Township. Residents in the area tell Action News say the hole covers a large part of the road and extends to the foundation of a house. Images from Chopper 6 HD taken shortly after dawn showed a massive hole encompassing the entire front yard of one home, part of the front yard of the house next door, and a section of sidewalk along Brooke Road. A tree had fallen completely into the crater, and a white pickup truck was tilted upwards at a roughly 45-degree angle near the edge close to one of the homes. First responders were on the scene. Cones, barricades and yellow caution tape were visible around the perimeter of the hole. Authorities have evacuated two neighboring homes. Brooke Road has been closed between West Chelfield and Argyle roads.